Personalized Keepsake Jewelry for Mom or Grandmothers, Name Bracelets & More! 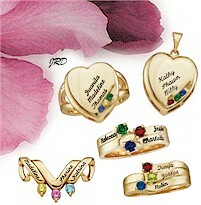 Mothers rings... many can are personalized with the names of your children and grandchildren. Also rings that are for sweethearts and daughter's. Select 10k or 14k, yellow or white* gold with genuine or simulated stones. A great selection of stacking rings have been added to the collection along with new mothers pendants and bracelets! Click here to view selection. Lovely designs that are set with stones to represent your unique family or special occasion. Optional laser engraving makes these items memorable keepsakes. Select 10k or 14k, yellow or white gold with genuine or simulated stones. Generally ships in about 2-3 weeks. Rings, pendants and bracelets. Click here to view selection. 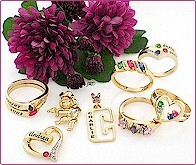 This is our fastest shipping, name-personalized collection of rings and pendants. Unique designs in 10k or 14k, yellow or white gold. Birthstone items are set with either genuine or simulated stones. Click here to view this collection. Pretty pendants crafted in sterling silver and set with sparkling birth month crystals. 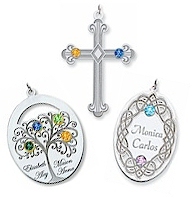 Two unique family tree designs, personalized crosses and more. Some designs include first names of mother's beloved family members. Click here to view this collection. A lovely bracelet that is crafted in sterling silver or 14k yellow or white gold with antiquing highlights. Engraving and optional genuine stones are also available. Make a lovely keepsake bracelet from mom. Click here to view the collection. 6. More Custom Mothers Jewelry Keepsakes! This collection offers mothers rings with birth month stones... some rings are also personalized with names to reflect each unique member of the family. You'll also find a few unique pendants for mom or grandma in this collection including a loop-design cross and a heart pendant that says "we love you". If you're searching for lightweight name plate pendants or rings, you'll find them here too! Click here to view selection. Copyright 2003-12 J. Dunne. ALL RIGHTS RESERVED. Copying from this web site is a violation of copyright law. Our pictures and content are for viewing only at this address and remain our property. They may NOT be copied, reproduced or modified in any form or manner. Use of this web site constitutes your agreement to our online store policies and terms. You must be at least 18 years of age to order from this store. We reserve the right to correct errors. Many of the items and designs are also copyrighted. Orders must be placed through our website- orders placed through cached browser or cached search pages will NOT be honored.